Reintroduced to Colorado 28 years ago, moose are thriving in many parts of the state. Elk hunters need to be sure know the difference between these two ungulates. A hunter who mistakes a bull moose for a bull elk can be fined more than $1,000. There’s no excuse for mistaking these animals. They are vastly different in size, color, antler shape and habits. The Shiras moose is the smallest of four sub-species, and much smaller than an Alaska moose, but a mature bull still weighs 1,200 pounds – about twice as much as the average bull elk. Moose are dark brown and appear almost black. Elk are light brown – a bull can be almost golden – with a pale yellow rump. A moose has a very large, long nose and a “bell” under the throat, compared with the relatively narrow snout of an elk. A mature bull moose also has broad, flat antlers, unlike the pointed antlers of an elk. But the antlers on some young bull moose have not flattened out yet, so hunters need to look over the entire animal before pulling the trigger. The largest member of the deer family, moose have adapted to a variety of habitats. They favor willows along streams and ponds, but “ridge runners” also forage in areas of lodgepole pine, oakbrush, aspen, spruce, fir and even sagebrush – in other words, areas wherever elk can be found. Moose act very differently than elk, however, when approached by humans. Typically, moose will not flee like elk at the sight of a hunter, which makes them easier to kill. So if it sees you and doesn’t run, it’s probably a moose. Despite these readily apparent differences, every hunting season brings a number of illegal moose kills. Circumstances vary from mistaken identity by hunters to blatant poaching. The common denominator in most accidental kills is that the hunter is not using optical aids besides the rifle scope. Always carry binoculars or a spotting scope to help you properly identify the species. The first moose to reach Colorado – 12 from Utah – were planted in the North Park region near Walden in 1978. The next year, another dozen were released in the Illinois River drainage. Some of these moose moved into the Laramie River Valley and, in 1987, an additional 12 animals were brought in from Wyoming. By 1991, the North Park population was doing so well that some of those moose were moved to the upper Rio Grande drainage near Creede. During the last two years, moose from Utah have also been transplanted on the Grand Mesa. 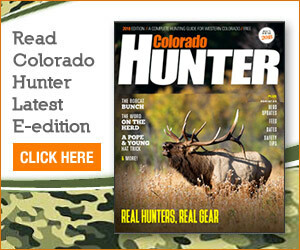 So, hunters need to remember that moose can be found in almost all the high-country areas of Colorado.